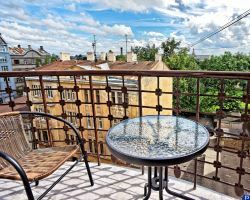 The RIGAAPARTMENT GERTRUDA is located in a city center at 54 GERTRUDES street. ... just a 15 minute walk or 5 minutes drive to Old Riga and 10 minute walk from the Central Railway Station. Only a 2 minute walk of the nearest public transport stop. There are 24 comfortable and convenient Apartments such as: studio, one-, two- or three-bedroom apartments and 19 Rooms with shared facilities for those who want quality accommo-dation on a budget and don't mind to use shared bathroom and kitchen facilities during their stay. The RIGAAPARTMENT GERTRUDA provides fully equipped kitchens, modern bathrooms with either bath or shower, washing and ironing facilities, bed linen and towels. Free WiFi throughout the property. 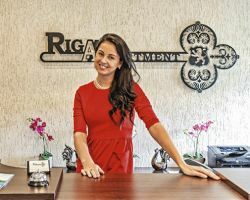 The RIGAAPARTMENT GERTRUDA Front desk staff is available 24 hours a day and can assist you with a luggage storage, ticket reservation, ordering flowers, car rental or concierge services. All your questions and any issues will always be dealt with promptly. Outdoor secured parking is available, located 5 minutes walk from the apartment building, the cost of 1 parking space 9.00 euros per day. On the ground floor there is a cafe-bistro LIDO, where every day a buffet breakfast is served from 8 am. Tasty Latvian dishes are served all day until 11pm. You will enjoy it’s friendly and informal atmosphere and the prices will make you smile. The RIGAAPARTMENT GERTRUDA is your key to opening the delights of our beautiful city. Your new experience, special events and fond memories are just waiting for you.